Baghdad: Lamia Al Gailani, an Iraqi archaeologist who lent her expertise to rebuilding the National Museum’s collection after it was looted in 2003, has died at age 80. Her daughter, Noorah Al Gailani, said Sunday that her mother died Friday in Amman, Jordan. She didn’t give a cause of death. A devotee of Iraq’s heritage and its museums, Al Gailani selected artefacts to display at the reopening of the National Museum in Bagdad in 2015, more than a decade after it was looted in the wake of the US invasion. The restored collection included hundreds of cylinder seals, which had been used to print cuneiform impressions and pictographic lore onto documents and surfaces in ancient Mesopotamia, now present-day Iraq. The seals were the subject of Al Gailani’s 1977 dissertation at the University of London. “She was very keen to communicate on the popular level and make archaeology accessible to ordinary people,” said her daughter, who is curator of the Islamic civilisations collection at the Glasgow Museum in Scotland. Al Gailani also championed a new museum for antiquities in the city of Basra, which opened in 2016. But she bore the grief of watching her country’s rich archaeological sites suffer looting and destruction in the years after the US invasion. Thousands of items are still missing from National Museum’s collection. Born in Baghdad in 1938, Al Gailani was one of the first Iraqi women to excavate in her country. Fresh from her undergraduate studies at the University of Cambridge in Britain, Al Gailani was hired as a curator at the National Museum in 1960, her daughter said. It was Al Gailani’s first job in archaeology. In 1999, she published “The First Arabs,” in Arabic, with the Iraqi archaeologist Salim Al Alusi, on the earliest traces of Arab culture in Mesopotamia, in the 6th through 9th centuries. After the US invasion, Al Gailani continued to travel to Iraq, determined to rescue its heritage even as the country convulsed with war. At the time of her death, she was working with the Basra Museum to curate a new exhibit set to open in March, said Qahtan Al Abeed, the museum director. 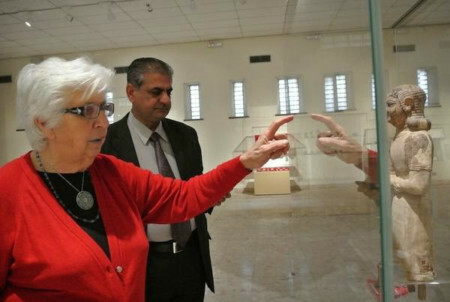 “She hand-picked the cylinder seals to display at the museum,” said Al Abeed. A ceremony will be held for Al Gailani at the National Museum on Monday. She is survived by her three daughters.